Observed at Edoret, Kenya, Africa. December 2012. Length about 8mm. 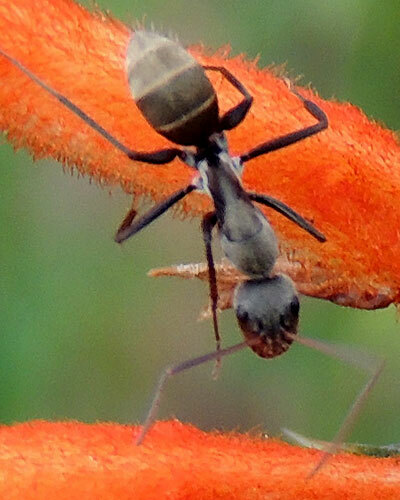 This one is foraging on Leonotis nepetifolia. Camponotus is a large genus of ants that very often nest in old, dead wood. Many species are strictly nocturnal, while others are diurnal. Camponotus are a frequent component of arboreal insects fauna, where they are important predators of insects and other invertebrates. 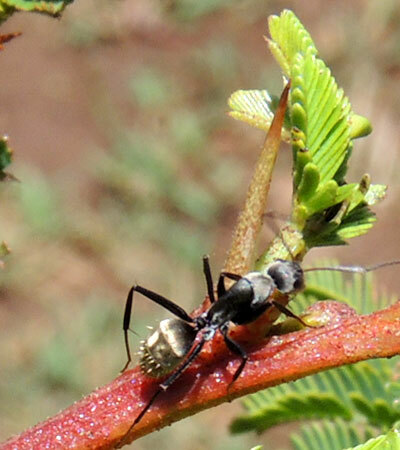 This species is common on grazing-tolerant shrubs in the highlands near Eldoret, Kenya. Dead or moribund insects may be taken. These ants can produce sharp concentrations of formic acid (HCOOH) that can be sprayed acurately at attackers. Thus most birds and lizards avoid taking carpenter ants as prey. Observed near Edoret, Kenya, Africa. April 2013. Length about 8mm. This one is foraging on Acacia seyal.